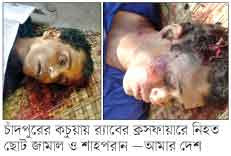 By Bangladesh Media: In Kochua of Chandpur 2 men were killed by the Rapid Action Battalione (RAB). Report confirmed about RAB-11 involvement. As usual RAB demanded that these 2 men were robber. Denying RAB's demand, the local says they were 2 active activists of the opposition political party Bangladesh Nationalist Party (BNP). The deceased are identified as Choto Jamal (40), son of late Kobbat Ali and Shahparan (35), Son of Golam Mostofa from the village Mogdair in Kochua Upazila of Chandpur district. In a report published in the Daily Amardesh dated on March 3, 2013, RAB demanded that the incident took place during the patrolling of a team from RAB 11 nearer Doaati in Sachar-Kochua road. The patrolling team meet robber gang and the gang opened fire on RAB. Which compelled them to fire back. Later RAB patrolling team found 2 bullet wounded dead body which were identified as Choto Jamal and Shahparan. But locals denied RAB's statement. They mentioned that they are the active activists of the opposition political party name Bangladesh Nationalist Party (BNP).